A Singapore court in this week has denied bail of accused anonymous hacker charged for hacking high value government websites. Last month a Singaporean hacker named James Raj was extradited from Malaysia. He was charged for hacking the Ang Mo Kio district website, whose MPs include Prime Minister Lee Hsien Loong, under the banner of worlds most dangerous hacktivist community Anonymous. The alleged hacking was among a string of cyber attacks that have also targeted the websites of Premier Lee and President Tony Tan as well as pro-government media, in a row over Internet freedom in the city state. This 35 years old hacker was deeply linked with Anonymous and he was covered himself with nickname "The Messiah". District Judge Soh Tze Bian said Raj, posed a flight risk because he previously jumped bail and fled to Malaysia after being slapped with illegal drugs consumption charges in 2011. Police have previously said Raj was also linked to other hacking attacks, including on the website of a charity associated with the ruling People's Action Party. 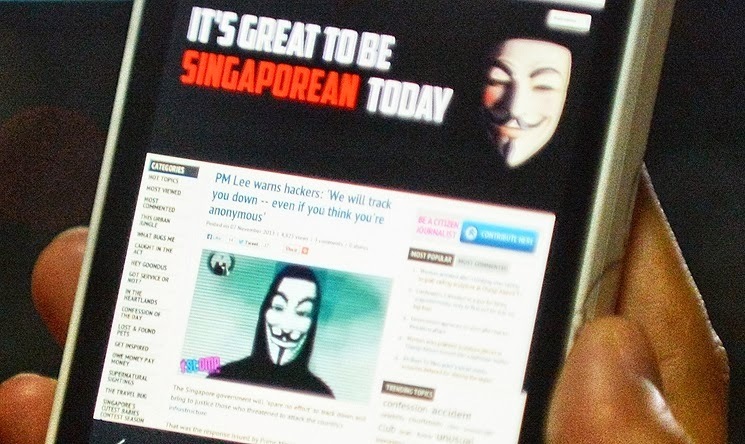 Two Singaporean men have so far been charged with defacing the president's website. Police have said that there are no links between Raj and these suspects. The round of attack from Raj took place three days before a self-proclaimed spokesperson for Anonymous appeared in a video on October 31 to demand the scrapping of a recent Singapore law requiring news websites to obtain annual licences. The Internet licensing rules, which came into effect in June, have sparked anger among bloggers and activists who say they are designed to muzzle free expression. Singapore strictly regulates the traditional media, but insists the recent licensing rules do not impinge on Internet freedom.